AB and Philip Morris International Inc. announced a joint venture Tuesday to market smokeless tobacco world-wide. 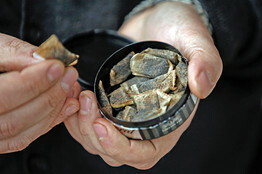 Snus, a smokeless tobacco, is now banned in the EU except in Sweden. Altria's giant cigarette unit, Philip Morris, outside the U.S.
smokeless tobacco tricky for regulators. products can be introduced to the market so long as they are smoked." say they believe it is a dangerous product."